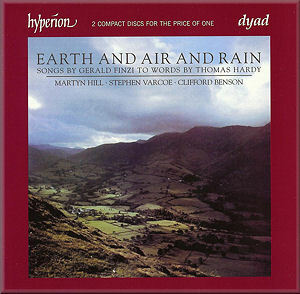 Hyperion continue to trawl their catalogue for grist for the reissue mill. These Finzi Trust-supported recordings entered the lists in the 1990s when the Finzi catalogue looked very sparse indeed. There was in 1989 no complete set of Hardy cycles on CD. The Lyrita recordings, reissued last year, had sunk far past the plunge of plummet. Naxos and Lyrita have entered the lists only in recent years. As usual with Hyperion everything is done diligently and with insight. All the words are in the booklet - no need to go to some website - and the perceptive and authoritative liner-note is by Finzi biographer Diana McVeagh who has a lifetime of Finzi scholarship behind her - not to mention her thoughtful work on Elgar. Valued little touches are exactly in place such as giving a date for each song for which a date has been found. At bargain price these discs command an eminent place in the market and when placed alongside the Hyperion Finzi and Friends disc you have the essence of Finzi in song. However you can do better. The 'problem' lies not so much - in fact not at all - with Clifford Benson. Listen to Stephen Varcoe in The Clock of the Years. He does characterise but he fails to etch the personality and drama of situation with the acted personality we find with John Carol Case on Lyrita. Also his voice has a distinct quaver when holding sustained note as in the word 'theirs' in Proud Songsters. While It Never Looks Like Summer Here is much better in this respect Hill ploughs comparatively shallow in I Look into my glass and again in He abjures love. Varcoe turns delivery of I need not go into sing-song - one feels little of the underpinning emotions and tensions. Compare the meaning with which Neil Jenkins imbues the words “… and lightly dance some triple time romance” in The Dance Continued, the last song in A Young Man's Exhortation with Martyn Hill's assumption. I will grant you that my reaction is affected by having imprinted on these songs from the Lyrita LPs a very long time ago. My reaction however was the same when I bought the full price Hyperion set when it was first issued. Then we come to one of my favourite songs - The Self Unseeing - the words “childlike I danced in a Dream” should have an ecstatic airborne sense of poignant liberation. They stay comparatively earthbound with Stephen Varcoe whose fragility of tone is also exposed in the words “Everything glowed with a gleam”. What is fascinating is the effect of the Second Viennese School on Finzi as borne in on the listener by songs such as The Too Short Time, The Comet at Yellham and Former Beauties. Britten's influence can be heard in the Childhood Among the Ferns. These five cycles comprise many great songs. If you discovered them via this set no disservice would have been done however if you can bear late 1960s analogue then go for the Lyrita set. I have been waspish in this review and I do not mean to infer that these performances lack insight or sympathy. Both qualities are there and are matched by much more than competence. However the full reach of Finzi's keen emotional scalpel is better felt with the Lyrita set … and this for all its analogue hiss, its sometimes papery piano sound and the dryness of Robert Tear's voice.